Telemedicine is booming, yet controversial. It’s receiving a significant boost in the healthcare industry as a result of the need for improved clinical outcomes. Patients who are monitored by telemedicine have shown better clinical outcomes due to a heightened awareness of their own readings. The American Telemedicine Association reported 1.25 million visits to direct-to-consumer providers in 2015. An increasing global focus on the use of telemedicine to reduce healthcare costs and improve patient outcomes is spurring huge growth in the telemedicine technologies market. Simply put, telemedicine is the use of telecommunications technology to deliver medical information or services to patients or other users located at a distance from the provider. In a new study, BCC Research finds that new US healthcare law will only intensify the focus on telemedicine, by increasing the number of people with health insurance who are seeking medical services. Major health insurers are expanding coverage to millions of Americans. Before healthcare coverage became so common, doctors had difficulty getting reimbursed for consultations over the telephone, let alone the Internet. Reimbursement of telemedicine varies by state and is sometimes seen as inadequate. Vendors including American Well, MDLive, and Teladoc (which has gone public) have been growing rapidly, thanks to health coverage from private insurers and employers. Many corporations are adding telemedicine to their benefit packages, as are some insurance companies. In the government-funded healthcare space, the VA and some state Medicare programs are beginning to use telemedicine. The global telemedicine market should reach $23.8 billion and $55.1 billion in 2016 and 2021, respectively, reflecting a five-year compound annual growth rate (CAGR) of 18.3%. The telemedicine market is segmented into telehospital/clinic and telehome markets. 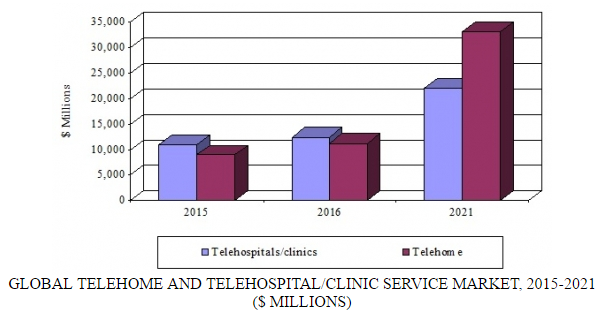 As a segment, telehospital/clinic totaled nearly $11.1 billion in 2015, while the telehome segment reached approximately $9 billion that year. The latter segment should grow at a projected CAGR of 24%, increasing its total market share from 45% in 2015 to 60% in 2021. The telehome technology market, which was valued at more than $5.3 billion in 2015, should dominate the telemedicine technology market during the forecast period. Telehome technology is expected to grow from 63.5% of the telemedicine technology market in 2015 to 68.7% by 2021. Telehospital/clinic technology is expected to approach $7.5 billion by 2021, accounting for 31.3% of the market, with a CAGR of 17.3%. “Although physicians’ fundamental ethical responsibilities do not change, the continuum of possible patient–physician interactions in telehealth/telemedicine give rise to differing levels of accountability for physicians,” the AMA’s Council on Ethical and Judicial Affairs wrote in a report that will be taken up by delegates. Encourage users to inform their primary care doctor when they engage online with a telehealth provider. AMA delegates have tabled the telehealth ethical guidelines at two meetings over the last year, and there’s no guarantee they will become part of the group’s policy this time. So how does telehealth quality compare with care from traditional medical providers? There have been many studies and they do not all agree. Austin Frakt of The New York Times surveyed the literature and concluded, on the whole, that telemedicine care quality is roughly equal to office visits. A systematic review published in 2015 found that patients with heart failure receiving telemedicine died at no higher rates than those not receiving it. Outcomes of care were the same for mental health, substance abuse, and dermatology patients who used telemedicine relative to those who did not. The review also found that telemedicine helped diabetics maintain better control of their blood sugar, and that it led to lower cholesterol and blood pressure. Global Markets for Telemedicine Technologies assesses the impact of recent technical, economic, legal/regulatory, business, and other developments on the industry. It explores ways in which collaborative healthcare can be better and more economically implemented through telemedicine. The report examines hardware and software providers, telecom and networking companies, healthcare companies, and health insurance providers. Analyses of global market drivers and trends, with data from 2015, estimates for 2016, and projections of CAGRs through 2021, are provided.